Thank you for your interest in Boy Scout Troop 344, Pemberville, OH. If you're new to Scouts and thinking about joining the program, or are currently a Cub Scout looking for a Troop to join, we hope that you'll consider Troop 344. Scouting is a great program offering a wide range of opportunities for boys ages 11 through 17. Boy Scout Troops vary widely in size, activities, and programs and, when looking for a Troop to join, it's important to make sure you have a "good fit" -- that the Troop, it's leaders, it's activities, and overall "feel" are a good match. Troop 344 is a mid size Troop and we believe that our size and numerous volunteers affords us a good deal of flexibility in setting our activities to best meet both the immediate and long term needs of our Scouts. We provide our Scouts with many opportunities for advancement and, on the average, one or more of our Scouts advance to the rank of Eagle Scout each year. We strive to maintain a balanced program of activities throughout the year to challenge the Scouts both mentally and physically, emphasizing leadership and character development in the Scouting tradition. The Troop participates in a wide range of activities and schedules at least one activity each month. Our activities during the past several years serve as examples of the program you can expect from Troop 344 in the years ahead. During this time we have participated in activities such as monthly campouts, including a weekend of winter camping, downhill skiing, orienteering meets, and numerous exciting tours (Corvette plant, power generating plant, Federal Courthouse, Mammoth Cave, etc). We have taken high adventure backpacking trips to the Sierra Nevada Mountains, Olympic National Park, Uinta Mountains, Rocky Mountains, Yellowstone, and the Appalachian Trail. Other adventure trips have included the Florida Keys, scuba diving, houseboating and waterskiing on Lake Cumberland, whitewater rafting, multi-day canoeing trips, staying on the USS Yorktown, and many others too numerous to mention. Of course, we always find time for an occasional "game night" with activities ranging from bowling to swimming. Check out our Troop Calendar to see the activites planned for the next few months. One highlight of the Scouting experience is the annual trip to summer camp. Each summer Scouts from Troop 344 go to Camp Berry outside of Findlay, Ohio. In choosing our summer camp we look for programs that offer opportunities to all levels of Scouts. Camp Berry meets these needs. At Camp Berry, our younger scouts are able to complete many requirements for advancement, while older Scouts concentrate on merit badges to help them on the trail to Eagle. All Scouts at Camp Berry enjoy the numerous activities the camp provides. These include rifle and shotgun shooting, archery, swimming, canoeing, climbing and rappelling, to name a few. Scouting is far more than camping, hiking, and games. Scouting is also about character, values, and community service. 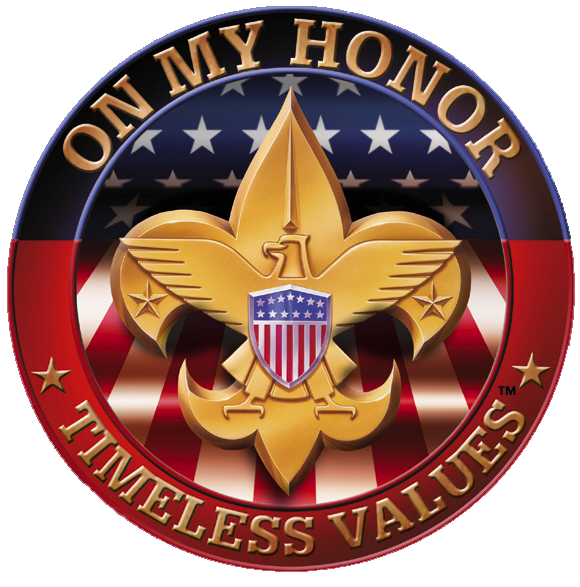 Troop 344 emphasizes the values embodied in the Scout Law and our Scouts regularly participate in a wide range of community support activities. Annual dues for Troop 344 are $65. Additionally, nominal charges are made to defray the costs of food on campouts, entrance fees, campsite fees, etc. We firmly believe that no boy should be denied the Scouting experience for financial reasons, and offer opportunities for our Troop members to earn money through fundraising activities or help them secure employment. We hope that Troop 344 will be part of your Scouting experience. Should you have any questions, or would like to arrange a visit to one of our Troop meetings, feel free to contact the webmaster or visit the Troop Calendar page to find the time and location of our Scout meetings and just show up. We invite you to cruise around the website for more information on our Troop, helpful information about Scouting in general (no matter which Troop you choose to join), and photos of our past high adventure trips.